Thank you for your response to my email. I have conveyed to Mr. Harris your kind offer to refund his payment for the problematic mezuzah scrolls. 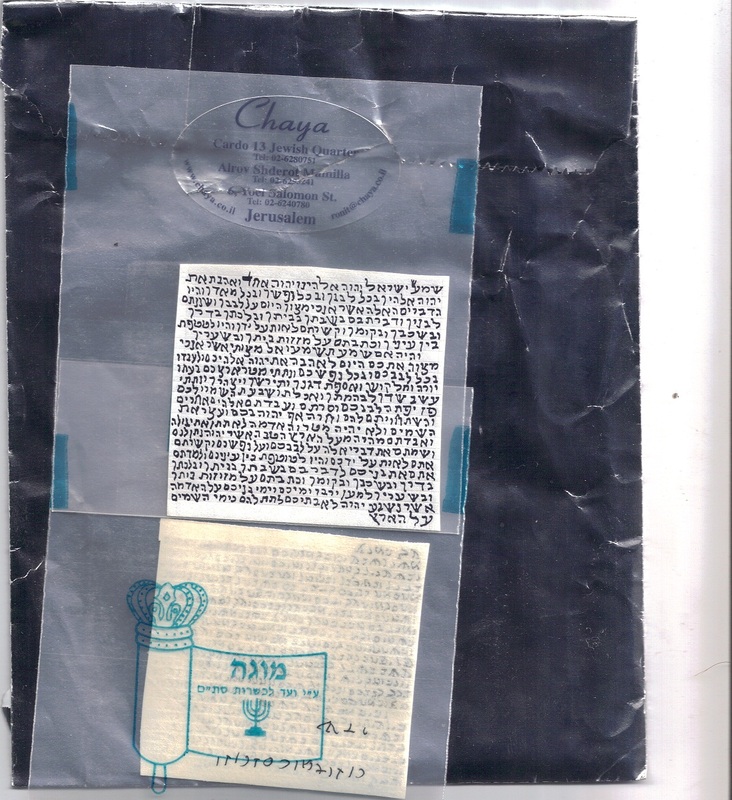 He is reluctant to return the mezuzot by mail and has asked me to bring them to Israel the next time I travel, which will be G-d willing for Passover. I hope that it will still be OK to bring them back in a few months. Also, I noted in your email that you say you are aware that some people do not consider the mezuzot you sell as kosher. You also write that you are doing the sales only as a “service to your customers”. Please excuse me for saying this, but I cannot see any type of leniency that would render these mezuzot kosher. Many of them have blatant spelling mistakes and all had flaws that are completely and utterly unacceptable. Again, if you doubt the seriousness of my claims, I suggest you show them to an independent rabbi. Furthermore, if you are doing this as a service to your customers and yet you know that these mezuzot are “considered by some as not kosher”, is this really a service to your customer? Why not sell mezuzot that are a little better in quality, written by a reputable sofer stam (of which there are thousands in Israel) that are kosher according to everyone? they need not be the large, expensively written ones, just a basic kosher product. I think that would be a far better service to your customers. Furthermore it would avoid this type of negative fallout which I hardly think is enjoyed by anyone, yourselves included. I thank you again for your response and for refunding Mr. Harris his payment. I wish you and yours a happy Channukah and blessings for all good things. I write to you with great concern and dismay regarding a very serious issue. Recently, a trusting customer by the name of Mr. Josh Harris of Melbourne, Australia purchased mezuzah scrolls from your establishment. The scrolls were brought earlier today to my offices for examination and found to be entirely unkosher. Not only are they unkosher, but they seem to be completely fraudulent, with a fake (hechsher) seal. The writing is so far removed from anything acceptable that there is no other way to classify these mezuzot, other than being fraudulent in nature. As you can understand, Mr. Harris is particularly upset about this incident. No one likes to be "duped", but it is particularly upsetting when the subject is of a religious nature, perpetrated by another Jew, in the holy city of Jerusalem. I am unsure what action Mr Harris plans to take, legally or otherwise. I would certainly think that it is in his rights to receive a refund. On a personal level (and this is the main reason for my writing), I strongly suggest you reconsider how and from where you source your mezuzot. I mean no disrespect, but aside from the moral and spiritual aspect of selling fraudulent mezuzot, I should think that your establishment’s reputation would eventually suffer (if it hasn’t already) if this practice continues. I, for one, will be forwarding a scan of these mezuzot with their false seals to a number of rabbinical agencies in Israel, of which I have regular contact with in my work with the Melbourne Beth Din. I thank you for reading this email and I encourage you to seek independent advice if you somehow doubt the seriousness of my claims. This is not so much about religious law as it is about civil law. Please refer to the attached image of the mezuzot. There were a total of 6 purchased by Mr. Harris. Chag Sameach and Shavua Tov! We appreciate your concern and understand your worries regarding this. Our shops specialize in Judaica, art and jewelry and we sell the scrolls only as a service to our customers. The scrolls are purchased from a sofer stam here in Jerusalem and we already heard some consider them kosher and others don't. Therefore, we are not arguing about this and if your community member who mad this purchase in our shop will so wish, he can send us all scrolls back and we will refund him with what he paid for them. A response I don't know. Hopefully the Rabbonim that can do something here will take action. How much did he pay for the mezuzos? Eli, You are wasting your time bro! So far, no reply. He paid 60 sheks a mezuzah. Josh, are you still doing shimush with Rav Freidlander? If yes, can you ask him what he suggests as the M"Z of vaad Mishmeres stam? I hate to be a pessimist, but it's probably a waste of time. I have a scan of an equally pasul mezuza I'm pretty sure was bought in the same shop 15 years ago (the mezuza on the right in this image: http://flic.kr/p/aCCsNC). The people who sell this junk have a million reasons why it's perfectly acceptable and nothing you're going to say will make any difference. Our best recourse is to educate people so they will be smart enough to avoid this stuff on their own. I see that seal a lot. Pretty much all Judaica stores sell those kind of cheapy Mezuzot and in my experience, it is futile to try and dissuade them from buying them in the future. I think the only thing we can do is just declare pasul all these Mezuzot and hope that customer outrage forces the shops to stop selling them. The Judaica stores just want to make a quick buck, and these give them the best profit margin. 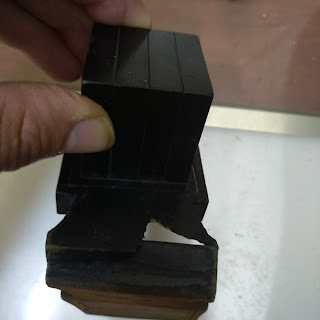 I believe these are MUCH worse then those paper Mezuzot because people see the "hechsher" and think they are high quality...at least with paper you know what it is. Had Mr. Josh Harris been educated he would of never fallen for this.The VAAD used to educate by showing videos and holding gatherings.WHAT HAPPENED TO VAAD MISHMERES STAM? Do you really think the Vaad could have reached a (probably) non frum Jew in Melbourne? they may be able to make presentations in Jewish schools, but for the people who grew up secular, this is all they have. When they go to the Judaica store and ask for a Mezuzah, they don't know the difference between parchment or paper, they trust the salesman who sells them these "Mezuzot"
A lot of this falls on us to educate, for example when I go to make a siyum or checking, I always bring samples of what is and isn't a kosher Mezuzah, and in most cases, people are shocked that their Mezuzot are and were never kosher. I think the best bet would be to educate the Rabbi's, especially the Reform/Conservative and then they can pass on the education on to their congregants. Which is exactly why I show them WHY the stuff from those places is pasul... if you open up those cheapy Mezuzot it's pretty simple to see, especially when you hold a nice Mezuzah next to it. 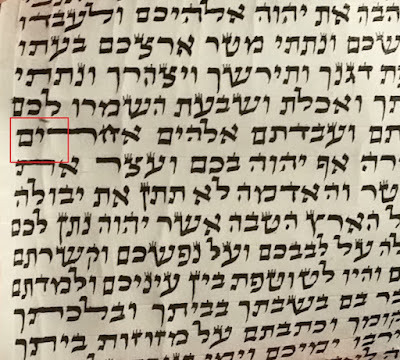 Ronit wrote "...and we already heard some consider them kosher and others don't..."
I know there are countless problems in this mezuza, however on line 11 the letter ב of besadecha is missing, "some consider them kosher"? At least she answered you. Yes. I plan on writing her back as soon as I have a chance. My agenda will be to meet her "sofer stam" when I am in Israel in a few months. Hopefully I will be able to reason with him. I doubt the "sofer" that writes these would listen..if this is what he writes and has the audacity to sell, I don't think he cares about its kashrut status. It is known that this "vaad lekashrut stam" is a fraud - I think R. Greenfeld made a big issue about this 20-30 years ago. 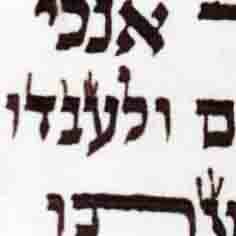 Whoever sees this stamp should know without any doubt the mzuza is pasul (even if it wouldn't miss the beis or anything) no doubt at all!! This is a fraud, they aren't written by sofrim, it has been found to be written by students in the university on shabbos for extra income, including women, [and lehavdil] israeli arabs.